Let's go medieval in Switzerland! 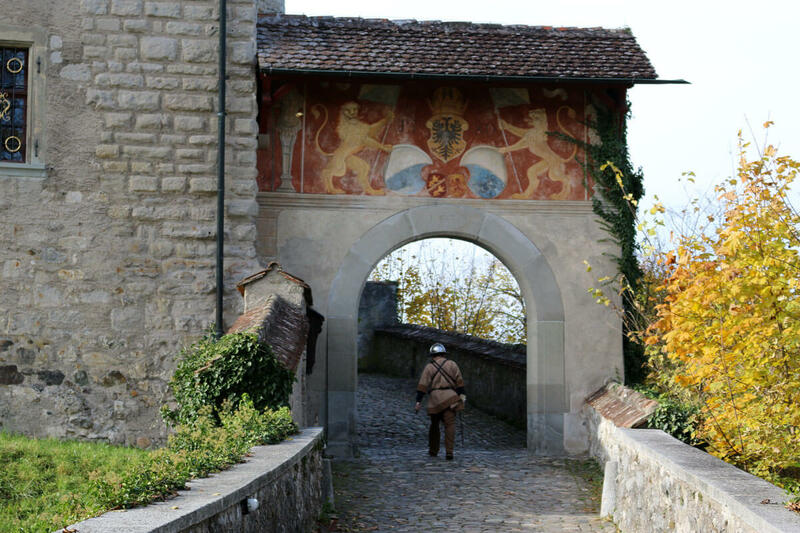 Three castles to visit.Let's go medieval in Switzerland! Three castles to visit. Let’s go medieval in Switzerland! Three castles to visit. Spring is here and summer is near! Have you taken out your list of must-sees in Switzerland? Sure, there are mountains and lakes and chocolate factories and cheese factories and Swiss-knife-factories and what-not-Swiss-made factories to visit... But have you thought of taking the family to one of the many medieval castles and fortresses of Switzerland? No single one may be as internationally renowned as the Palace of Versailles of France or the Windsor Castle of England. Nor were their previous owners ever kings or queens of Switzerland. In fact, because there were so many families and dynasties paying allegiance to different monarchs throughout the middle ages, no birth of a single king ever rose to “rule” Switzerland. This did not mean that they did not build castles and walls and forts to enjoy a noble lifestyle while also protecting themselves from potential invaders. After all, it was the middle ages and everyone seemingly had a reason to wage war against everyone else. Whether it be a border war, a religious dispute, or simply a means to expand their rule, these noblemen built impenetrable stone citadels that are still standing today. Curious about the life of the medieval Swiss? You can enjoy learning all about it when you decide to make one of the many medieval sites your destination. Here is our list of three day trips, precisely for that. This might just be the most famous Swiss castle. 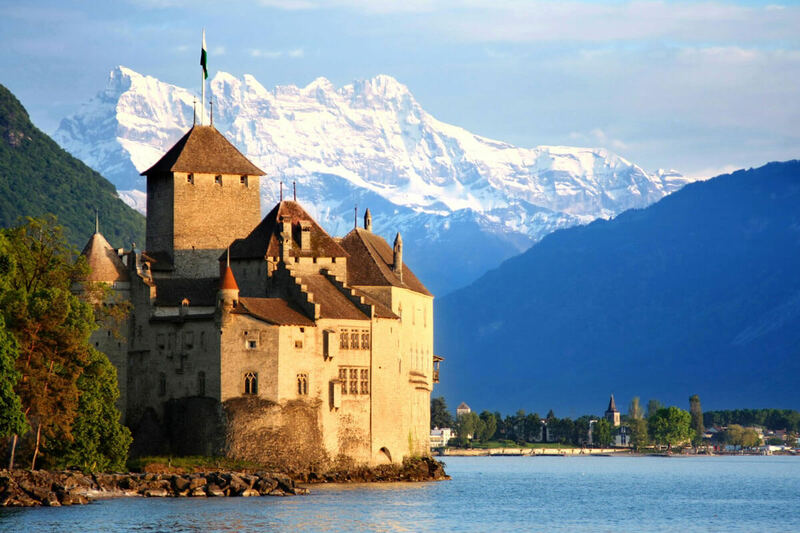 Château Chillon is notably the most visited historic building in the country. So if you have not been here yet, do not worry about being a sell-out. There are many good reasons why tourists flock here as part of their Swiss experience, no harm in joining the fun! The castle is situated along the coast of Lake Geneva in the city of Montreux. The views of the imposing alps across the lake are breathtaking. The first record of the fort dates back to the 11th century. But through the centuries, it has become the castle it is today - which might just be how you always imagined castles to look like: Stone walls that rise above the lake waters, capped with numerous cone towers and maybe even a seagull or two standing guard on top. Château Chillon is a perfect setting for fairy tales! Which it may have been, before it became a prison in the 16th century. Visiting the 25 buildings and three courtyards within this complex will surely quench your thirst for everything medieval. If you have the time and interest, renting an audio guide can do wonders: It will transport you into the shoes of those nobles, experiencing their joy and excitement in times of love and victory, or into the shackles of the prisoners in the dungeons, fighting the insanity and loneliness while surrounded by the haunting noise of strong winds and deafening waves. The many rooms, halls, paintings, clothes and weapons, however, have more than enough simulations and information to satisfy your curiosity. But be ready to spend your entire day here if you want to explore every corner and exhibit on display. After a fulfilling day of medieval life within damp castle walls that hold secrets you could only imagine, you will feel relieved that you live in the 21st century. 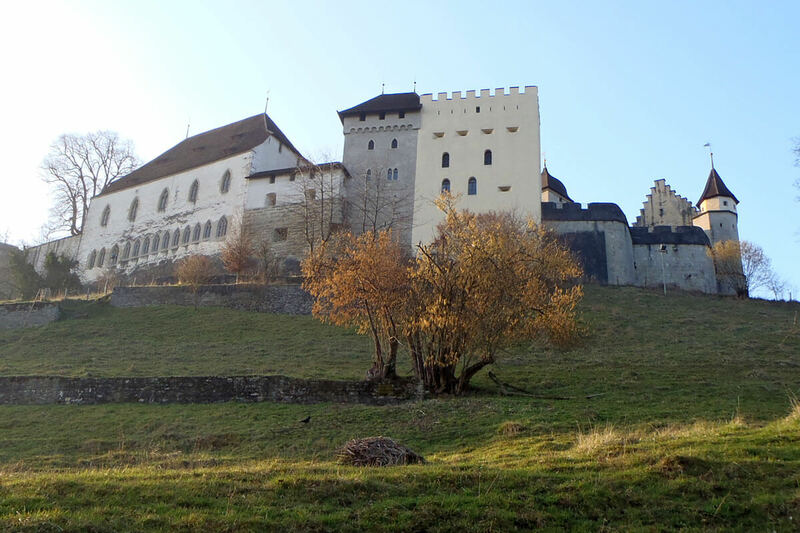 In contrast to numerous castles in the country that were built by lakeshores, Schloss Lenzburg in the Canton of Aargau sits high on top of a hillside. (Depending on where you are from, you might call it a mountain.) The hike up can be taxing, but the winding road and the view of the town and region below soon becomes a very rewarding experience. 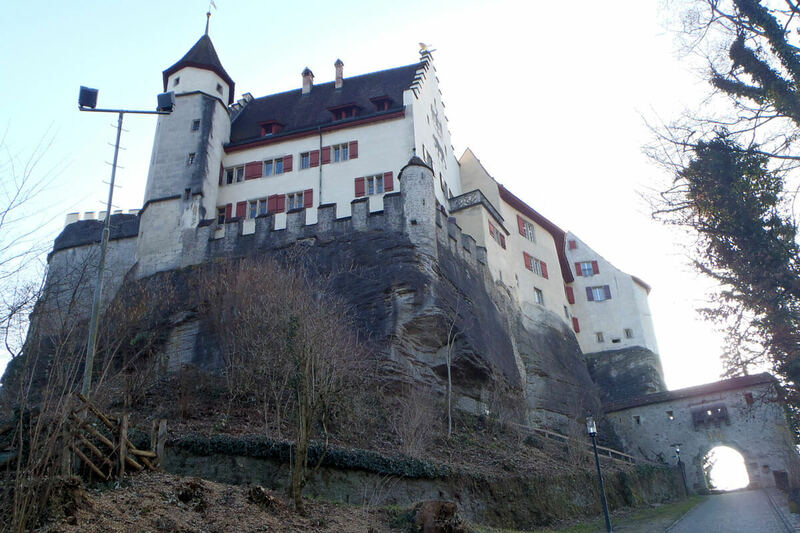 This castle dates back to the 12th century, making it the oldest hilltop castle in Switzerland. It boasts of a rich history, housing a variety of residents throughout its time. From dukes and duchesses to British royalty, it even served as a home to a poet and explorer. A little less touristy than Château Chillon, Schloss Lenzburg can be quite a pleasant castle experience. Aside from the museum and its well preserved exhibits of rooms, dining halls, or prison cells, a children’s exhibit is perfect for the little ones to explore the corridors and relive the medieval lifestyle. Many events are also hosted here during and after the opening hours of the museum. If you are lucky, you might chance upon a lesson of folk dance of the middle ages, or even a medieval market selling handmade crafts typical of the period. Sometimes, concerts or theatre shows are also held in the halls, and the courtyards and surrounding forests are often frequented by local schoolchildren. For those curious about exploring the area around the castle, this destination might just be a perfect rest stop on your bike tour or hike around the region. The Museggmauer, or Musegg Wall, is not really a castle of its own. 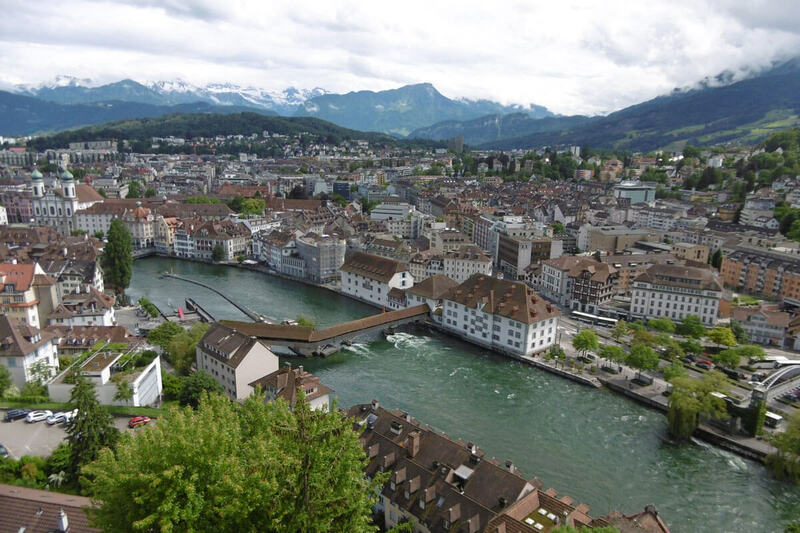 In fact, it is the remains of the city wall of Luzern, built in the 14th century along with the famous Chapel Bridge to protect the town of Luzern. 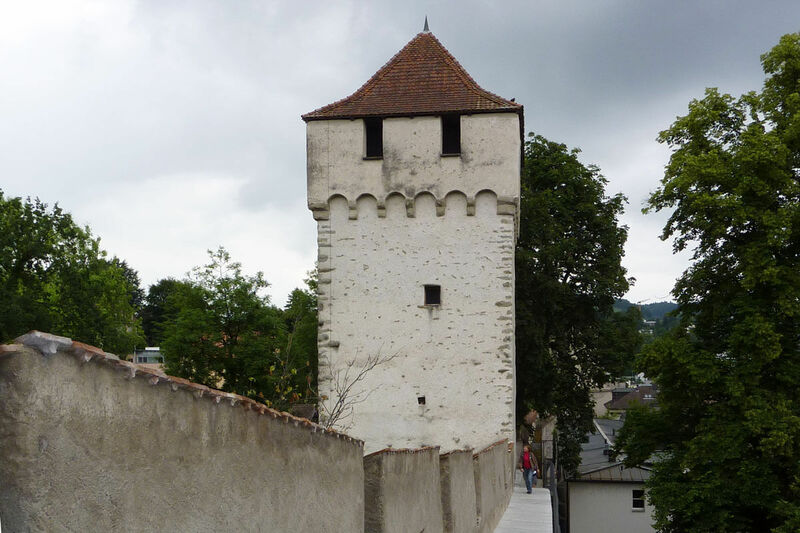 Because of the cultural importance of this city wall, Luzern children learn the phrase: «Nölli-Männli lueg is Land, wach of d’Zyt, scherms Polver met em Allewende-Dächli» to remember the names of the nine towers that comprise the Musegg Wall, namely Nölliturm, Männliturm, Luegislandturm, Wachtturm, Zeitturm, Schirmerturm, Pulverturm, Allenwindenturm, and Dächliturm. One of the towers, Zeitturm (Clock Tower), houses the oldest city clock which chimes exactly one minute before all the other bells in the city. Just to make sure you notice. And atop the Männliturm, the view is magnificent! 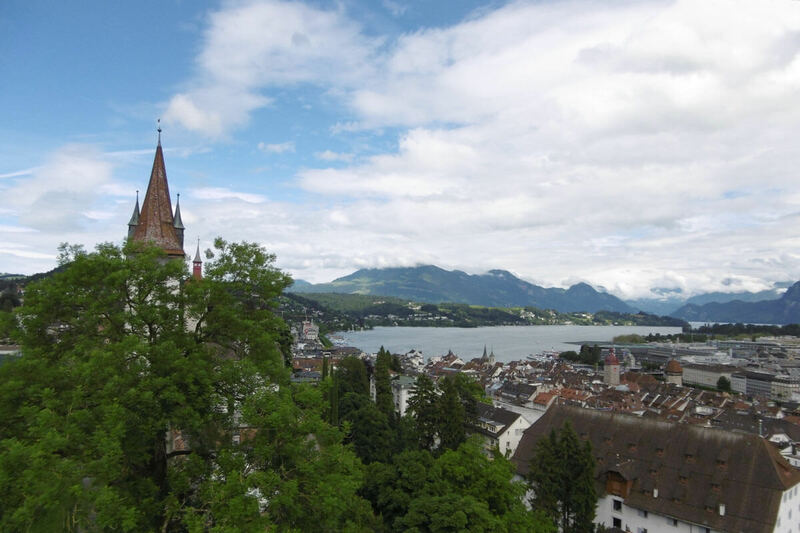 Overlooking the Chapel Bridge and the Lake of Luzern and beautiful mountains surrounding the area, it is not difficult to appreciate the strategic importance of these towers even while you are enjoying the view. Because this tour is free for all visitors, an app is available for additional information about the city wall (and other walking tours in the city, too). Because most of the time, the information at the sites is only in German. Click here for your free city guide. This year, when the weather is not quite ideal for hiking in the hills or swimming in the lakes, and when you have had your fix of everything else Swiss made, why not head out to commemorate the past lives of the past nobility? Their lives were definitely quite interesting, whether imagining the suffering in the dungeons or reading about the endless intrigue and conspiracy that tainted the lives of the aristocrats. And when all of this gets too show-biz for you, you can always just climb up to the top and enjoy the views. 8 unique traditions you’ll not find outside of Switzerland Love nature? Don’t miss these flower tours in Switzerland!